An inside look at the latest cables, picks, strings, pedals and more from the legendary Ernie Ball company. 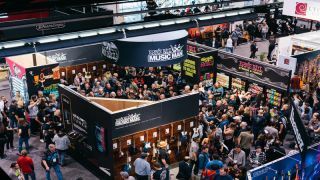 Over 100,000 music enthusiasts and guitar fans flocked to the Anaheim Convention Center for the 2019 NAMM Show last month, in what is recognized as one of the biggest and most anticipated music gear-related events of the year. Countless gear manufacturers were on hand to show off their latest products, and among them was the legendary Ernie Ball company, who is hitting the marketplace in a big way this year with a range of new cables, picks, strings, pedals and more. You can check out what's new below. The VPJR Tuner is the perfect combination two-in-one pedal offering precise volume control with an enhanced-definition digital tuner. The pedal features a fast and accurate chromatic tuner with graphic volume display that is visually attractive and easy to operate. The large display automatically switches between tuner and volume modes depending on the signal level, allowing the player to tune at minimal volume. Other “always on” configurations are accessible by double tapping the touch screen. The tuner can also be calibrated to a variety of ideal reference pitches. The pedal’s compact, rugged design consists of an aluminum housing, and features a stronger, more durable PVC-coated Kevlar cord ensuring consistent tension throughout the foot sweep. Ultra and Burly Slinkys are the newest additions to the Slinky guitar family. These new hybrid gauges combine popular slinky string sets offering additional options in terms of tone and feel. Ultra set combines Regular and Power Slinky sets, with gauges of .010, .013, .017, .028, .038, .048″ and the Burly set combines Power and Skinny Top Heavy Bottom Slinky sets, with gauges of .011, .014, .018, .030, .042, .052″. Launching globally March 1. The Ernie Ball Axis Capo’s ergonomic features allow for fast and accurate single-handed key changes. A dual radius design conforms to flat or curved fretboards, ensuring buzz-free operation on 6- or 7-string electric and acoustic guitars. Ernie Ball capos are made from aluminum and feature a lightweight rubber handle for comfortable operation. Finishes available in Black Silver, Brown, and Gold. Launching globally July 1. Made for concert and soprano Ukulele players, the strings' highlight feature is the ball end which offers faster installation and better tuning stability over traditional tie end strings. Ernie Ball’s Ukulele strings are offered in traditional clear resin for a bright, balanced tone with excellent projection and black resin for a warm, rich tone with percussive attack. These strings are made from nylon monofilament and are available in clear gauges (.028”, .032”, .040”, .028”) and black gauges (.028”, .032”, .040”, .028”). Launching globally March 1. Ernie Ball Prodigy picks feature highly durable delrin material for a more secure non-slip surface. The machined beveled edge and sharp point at bottom allow for less drag, added articulation, and precise control while playing. Now available in four new shapes and a multipack, all offered in two thicknesses. Launching May 1 in North America and June 3 internationally. Known for their bright colors and high quality, durable material, Ernie Ball's new instrument cables feature superior components that are built to last. Dual-conductors deliver reliably clear tone with crisp highs, tight mids, and rich harmonics. Multiple shielding materials preserve the signal with low handling noise, and the durable exterior ensures long-lasting performance. They come in braided, patch, straight, coiled, speaker, and microphone and are offered in different lengths to meet your needs. Launching domestically February 15 and internationally March 15. To find out more, head over to ernieball.com.